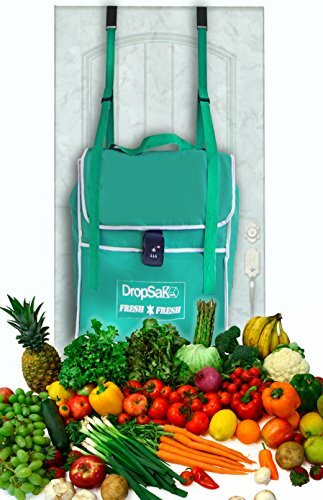 FIRST EVER Grocery Delivery DropSak Fresh - Front Door Hanging Thermal Soft Drop Box. Perfect for Amazon Fresh, Fresh Direct, Whole Foods, Peapod,etc. Availability. The DropSak Fresh™ is available on Amazon with Amazon Prime. This bag seems to be popular, and supplies are limited. Security features. The DropSak Fresh™bag attaches to the delivery door with sturdy, low-profile metal hooks that hang on the the door; once hung, the door can be seamlessly closed and locked. Once a delivery is made, the delivery person can easily lock the bag with a combination lock that comes standard on every DropSak Fresh™bag. The DropSak Fresh™bag is the only bag available that secures easily to the front door with hooks. We like this feature because it works so well with nearly every door where packages are delivered. The DropSak Fresh™bag is also the only package delivery bag we're aware of that's insulted. It's insulated with foam and lined with temperfoil, the material you often see in insulted lunch bags. Including insulation is a thoughtful feature given the growing number of households that are ordering their groceries online through programs like AmazonFresh, FreshDirect, and others. Items that have been stored in cool refrigerators certainly will have a better chance of staying fresh in a hung, locked, and secured DropSak Fresh™bag than if they were left on your porch, exposed to the elements, bugs, and porch pirates. The Package Panther is a heavy-duty porch package bag that delivers security and protection to your delivered packages that rivals parcel boxes but at a fraction of the cost. This is a perfect bag for online shoppers who want a strong layer of security for their parcels/packages but don't want to pay the full price of a parcel box or who don't have enough space for a parcel box. PACKAGE PANTHER - The GOLD STANDARD in Package Protection. Stainless Steel Mesh (FULLY-LINED) JUMBO Waterproof SLASHPROOF Bag. Combo Cable-Lock (6mm Steel). Delivery Instruction Placard incl. Availability. The Package Panther is available on Amazon with Amazon Prime. Bag dimensions. 32 x 40 inches. This is the largest available package bag we have included in this review. It can fit packages as large as 20 x 14 x 12 inches. Security features. The Package Panther is lined with stainless steel mesh. Its listed as being slash-proof which is a valuable feature to have in the event that a locked package bag isn't already enough of a deterrent to discourage some extra aggressive porch pirates. It also comes with a long, sturdy 6 millimeter-thick cable, lock, and easy-to-read instructions. This cable allows you to lock the Package Panther to your door and enables delivery professionals with the ability to lock packages in the bag. The Package Panther is the only package bag that is lined with stainless steel mesh which makes it a very robust porch package bag. It also has the strongest locking mechanism to keep the bag on your porch with its 6mm thick steel cable. The lining on the Package Panther is also lined with two layers of waterproof fabric. Although the bag does not fully seal locking all water out, it offers some significant water protection that online shoppers wouldn't get without a package bag. The Original Porch Pirate Bag is similar in design and features to the Package Panther, but doesn't feature the stainless steel mesh. Still, the nylon material is high-quality reinforced ballistic nylon meaning it's much more solid than a typical bag and could be challenging for a porch pirate to slash through with a knife. It would certainly withstand a solid tug should a package thief try to test its strength in an attempt to potentially steal its contents. Security features. Like the Package Panther, The Original Porch Pirate Bag comes equipped with a steal cable and lock plus bag lock. 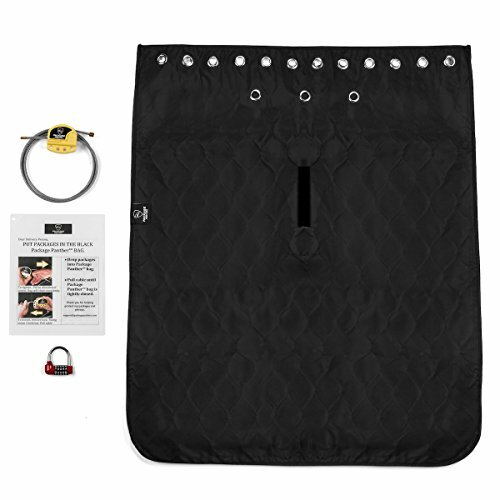 The cable is design to allow the bag to be secured to a front door, railing, or other secured item near the delivery door where packages can remain until the online shopper retrieves them, Once the package is delivered, the bag can be locked with combo lock that is also part of the bag. 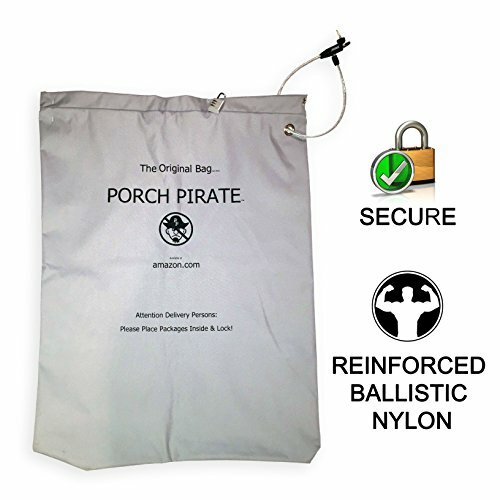 The Original Porch Pirate Bag is the only bag using reinforced ballistic nylon. It's a solid fabric that might be second in security only to the Package Panther. The Original Porch Pirate Bag, just like other bags and parcel boxes, has its unique operating instructions. Rather than relying on a placard or the intuition of the delivery person, instructions on the bag's use are printed right on the bag. "Attention delivery persons: Please place packages inside & lock!" Should I buy the DropSak Fresh™, Package Panther, or The Original Porch Pirate Bag? All three of these porch package bags have great features, so it depends. We recommend considering the DropSak Fresh™if you order any groceries using online stores – something that's becoming more and more common in 2018. No other bag currently available for purchase offers both insulation and a locking security mechanism (although a company named Delivery Parcel Solutions is crowdsourcing a fundraising effort on Kickstarter to develop and sell their e-Com Case 1.0.). The DropSak Fresh™bag is also the cheapest option available. If you're looking for an inexpensive option that has more room than the DropSak Fresh™, The Original Porch Pirate Bag is a great option with its much larger capacity. It is large enough to take several small- to medium-sized packages, and it has some great security features that you can't benefit from through other prevention techniques like installing and using a video doorbell. The Porch Panther is our favorite choice for security. Only the most determined thieves would be able to access your goods while most would be discourage or not even try. Secure porch package bags like the Porch Panther move package theft from a crime of opportunity to a more planned crime that fewer criminals are willing to attempt. If your goal is to give yourself the best chances of keeping your packages dry and secure from the time they are delivered until the time you get home, and if you like the concept and convenience of porch package bags, then we recommend the Porch Panther.